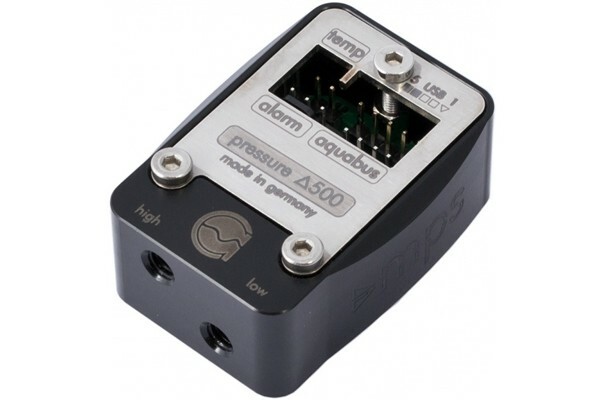 The pressure sensors of the mps pressure series have many applications. As fill level sensors they can be used ideally with long tube reservoirs, measuring the pressure of the water column abive the sensor. To use the sensor as a fill level sensor, it should be installed at bottom level of the reservoir or below and connected to the bottom connection threads on the reservoir. Additionally the second connector of the pressure sensor (only type Delta 40/100/500) must be connected to the air bubble of reservoir, e.g. by connecting it to a connector in the top of the connector. Alternatively a pressure equalization membrane can be used (for all types). Fittings and pressure equalization membrane are not included and must be ordered separately! Another possible application is the measurement of pressure difference over filters for monitoring of the increase in flow resistance caused by contamination. This allows easy and much more precise meaurement compared to optical inspection of the filter element. The same applies to contamination of micro-structure water blocks. A pressure difference measurement between In- and Outlet of a pump is suitable for functioanlity monitoring and gives valuable information to professional hardware testers. All sensors feature integrated analyzation electronics with USB and aquabus interface, a configurable alarm channel as well as an external temperature sensor input. Oh, hier haben wir einen Fehler im Shop, denn es wird nur einer benötigt, nicht zwei. Wird umgehend korrigiert. Es ist so, dass Sie den Reduziernippel entweder über High oder Low testen können, nicht aber beides. Ein Kreislauf besteht ja nicht in dem Sinne. Tut uns sehr leid.